Evidence of a community of prehistoric artists and craftspeople who “invented” ceramics during the last Ice Age – thousands of years before pottery became commonplace – has been found in modern-day Croatia. 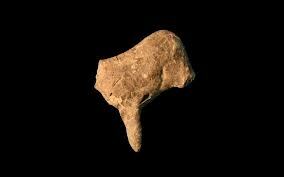 The finds consist of 36 fragments, most of them apparently the broken-off remnants of modelled animals, and come from a site called Vela Spila on the Adriatic coast. Archaeologists believe that they were the products of an artistic culture which sprang up in the region about 17,500 years ago. Their ceramic art flourished for about 2,500 years, but then disappeared. The study, which is published in the journal PLoS ONE, adds to a rapidly-changing set of views about when humans first developed the ability to make ceramics and pottery. Most histories of the technology begin with the more settled cultures of the Neolithic era, which began about 10,000 years ago. Now it is becoming clear that the story was much more complex. Over thousands of years, ceramics were invented, lost, reinvented and lost again. The earliest producers did not make crockery, but seem to have had more artistic inclinations. The Vela Spila finds have been the subject of intensive investigation by researchers at the University of Cambridge and colleagues in Croatia since 2010. Their report, published this week, suggests that although earlier ceramic remnants have been found elsewhere, they had no connection with the site, where the ability to make these artefacts appears to have been independently rediscovered by the people who lived there. “It is extremely unusual to find ceramic art this early in prehistory,” Dr. Preston Miracle, from the University of Cambridge, said. “The finds at Vela Spila seem to represent the first evidence of Palaeolithic ceramic art at the end of the last Ice Age. They appear to have been developed independently of anything that had come before. We are starting to see that several distinct Palaeolithic societies made art from ceramic materials long before the Neolithic era, when ceramics became more common and were usually used for more functional purposes.” Vela Spila is a large, limestone cave on Korčula Island, in the central Dalmatian archipelago. Excavations have taken place there sporadically since 1951, and there is evidence of occupation on the site during the Upper Palaeolithic period, roughly 20,000 years ago, through to the Bronze Age about 3,000 years ago. The first ceramic finds were made back in 2001. Initially they were almost overlooked, because it is so unusual to find ceramic in the Upper Palaeolithic record. As more ceramic emerged, however, examples were set aside for careful analysis. Researchers meticulously checked the collection for tell-tale evidence of modelling on the artefacts which would confirm that they had been made by a human hand. In all, 36 cases were identified. Broadly, the collection belongs to a material culture known as “Epigravettian” which spanned 12,000 years, but radiocarbon dating has allowed scholars to pin down the Vela Spila ceramic collection to a much narrower period, between 17,500 and 15,000 years ago. Those which can be identified appear to be fragments of modelled animals. The ceramics were clearly made with care and attention by real craftspeople who knew what they were doing. One of the better-preserved items, which seems to be the torso and foreleg of a horse or deer, shows that the creator deliberately minimised the number of joins in the model, perhaps to give it structural strength. They were also marked with incisions, grooves, and punctured holes, using various tools, probably made from bone or stone. Finger marks can still be seen where the objects were handled while the ceramic paste was wet. As well as being the first and only evidence of ceramic, figurative art in south-eastern Europe during the Upper Palaeolithic, the collection’s size, range and complexity suggests that Vela Spila was the heart of a flourishing and distinctive artistic tradition. Although the finds bear some similarities with ceramics discovered in the Czech Republic, which date back a further 10,000 years, there are enough structural and stylistic differences – as well as separation by a huge gulf in time – to suggest no continuity between the two.